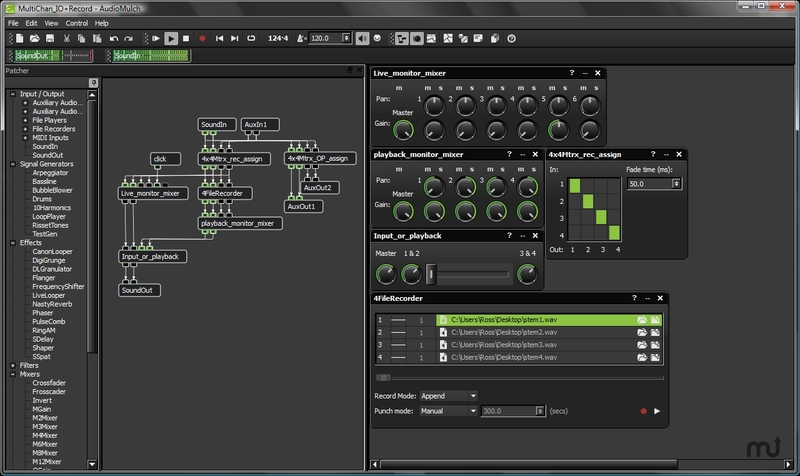 Audio tool for live electronic music performance, composition and sound design. Is there a better alternative to AudioMulch? Is AudioMulch really the best app in Audio category? Will AudioMulch work good on macOS 10.13.4? AudioMulch is an interactive musician's environment used for live electronic music performance, composition and sound design. AudioMulch allows you to make music by patching together a range of sound producing and processing modules. Unlike some patcher-based programming environments, AudioMulch's modules perform high-level musical functions, so you don't have to create things from the ground up using individual oscillators and filters. AudioMulch is designed for live performance and improvisation - you can process live audio sources and control every knob and slider on the user interface using a MIDI controller. Note: Due to changes made to the SSpat contraption in the 2.2.0 release, documents saved with AudioMulch 2.2 (or later) that use SSpat will not load correctly in AudioMulch 2.1. Users who wish to continue using these documents with AudioMulch 2.1 are advised to make backup copies for use with AudioMulch 2.1 before saving them with AudioMulch 2.2. Fixed LoopPlayer bug where a muted LoopPlayer would sometimes start unmuted until the beginning of the next bar. This happened if a document was first played starting from anywhere other than the start of a bar (including when synced to MIDI or Network Sync). Fixed extremely distorted audio when using over-unity floating point sound files in some contraptions (e.g., LoopPlayer). Fixed LiveLooper crash when creating very short loops. Fixed LiveLooper assertion failure crash "Assertion failed: (state_ == RECORDING)" if automation or MIDI control tried to clear a track while it was recording. Fixed intermittent LiveLooper assertion failure crash "Assertion failed: (nextRecordTrack_ == 0)" when all tracks were empty. Fixed AudioUnit hosting bug: sliders in the generic editor were not updating when parameters were changed using the custom editor or automation. Fixed Network Chase Sync bug where tempo could sometimes become unstable (even after resetting sync by toggling enable audio off and on again). Fixed rare crash in automation graphics rendering triggered by MIDI and/or Network Chase Sync bug(s) above.